Peter Farrie Songwriter – A songwriter with a compelling commentary on life. Peter Farrie is a Devon, UK based songwriter. His self-produced debut album Skeptileptic was released in 2018. His songwriting and sound has drawn comparison with Belle and Sebastian, The Divine Comedy, Tim Minchin and Tom Lehrer. 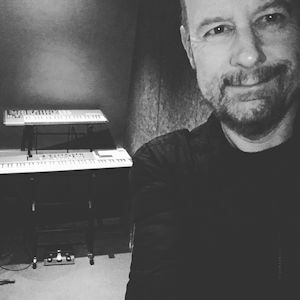 Peter is currently studying on the Songwriting MA Programme at ICMP London and is writing and producing fresh material. 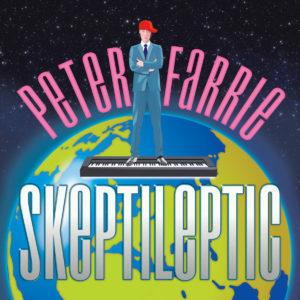 Some reviews of Skeptileptic (2018). Well frankly I’m addicted to Peter Farrie’s dry wit and philosophical banter surplanted on catchy, genius little tunes interweaving a range of genres designed to capture audiences of all ages and persuasions and hook them in to his delightful subliminal messages celebrating humanity, technology and the mysteries of the universe! A BIG album packed full of surprises! It’s what I’ve been waiting for… If you’re looking for the sounds of science, Skeptileptic is not to be missed. 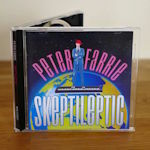 Peter Farrie’s new album brings lyrical art to the scientific world, covering myriad topics with a gentle wink characteristic of his usual dry humour. Witty, catchy, and much needed in this post-fact era. Go buy it!